Yesterday, I had the opportunity to help out at Packinghouse Brewing Company's Brew Grass event. Even though it was Africa hot, the event was a lot of fun! 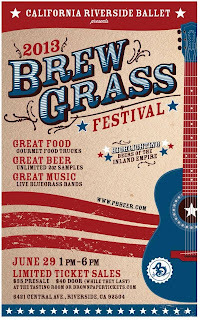 Live blue grass bands, tasty craft beer, and food trucks serving up food helped to ensure that everyone had a great time. I'd have to say my favorite booth of the day was the fella selling the amazing misters. He was kind enough to refill the misters throughout the event with ice cold water! Once again, Packinghouse Brewing Company put together a fantastic event! One of my most favorite signs! After attending the inaugural Firestone Walker Invitational Beer last year, I was immediately looking forward to this year's fest. I counted the days down from when I purchased my tickets until the day of the event, June 1st. This year did not disappoint. From the moment I entered the event to when I exited, I was impressed. Firestone Walker improved an event that I didn't think could be improved upon! Forty four craft breweries brought amazing beers to sample. Not only did they bring the beers, but they also brought their brewers! Having an opportunity to chat with the people responsible for making the beers at an event is a fantastic idea. Throughout the day, brewers also held sessions in an area of the fest to chat with the people about their beer. The layout for the event was simple and made it easy to find the beers listed on the handy guide given to all fest attendees. I actually didn't even look at my guide until after the event had ended. I kinda wish I had, since there was an opportunity to win tickets to next year's event by simply voting for your favorite brewery of the day. It was great to be able to not only sample beers from breweries in California and the rest of the United States, but also to try beers from other countries. I loved having a chance to try Mahr's Brau Bamberg Ungespundetes "U" from Germany! Even though the day was Africa hot, reaching a temperature over 100 degrees, water was plentiful around the event. The event planners also had the foresight to place large outdoor swamp cooler fans in various locations to give festival goers an opportunity to cool down. Nearly all of the brewery booths had misters helping to cool off those waiting in line as well as those pouring the delicious craft beer. Along with beer, everyone also was able to sample gourmet food throughout the day. From wood-fired pizza to gelato made with various beers, there was something for everyone to enjoy. Live music helped add to the ambiance at the fair grounds and make for a fun-filled day. Firestone Walker definitely knows how to put together a beer event. 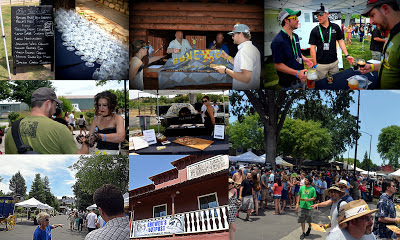 Just like last year, I can't wait for the next Firestone Walker Invitational Beer Fest!